Acrylic on Canvas. Sally is an actor and Educator by training; and a painter and writer by trade. She has lived in Africa for 28 years and in Rossland for 10, where she has worked as a gallery owner, an art educator, a painter and a writer. Her paintings are bold and colourful, with a strong sense of design. 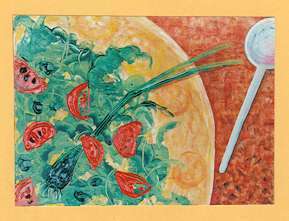 She is well known for her “food” art amongst other things that have enhanced local restaurants.She has been selected for the BC Festival of the Arts for both painting and writing. Tourists from around Canada have returned home with her work after visiting her studio.